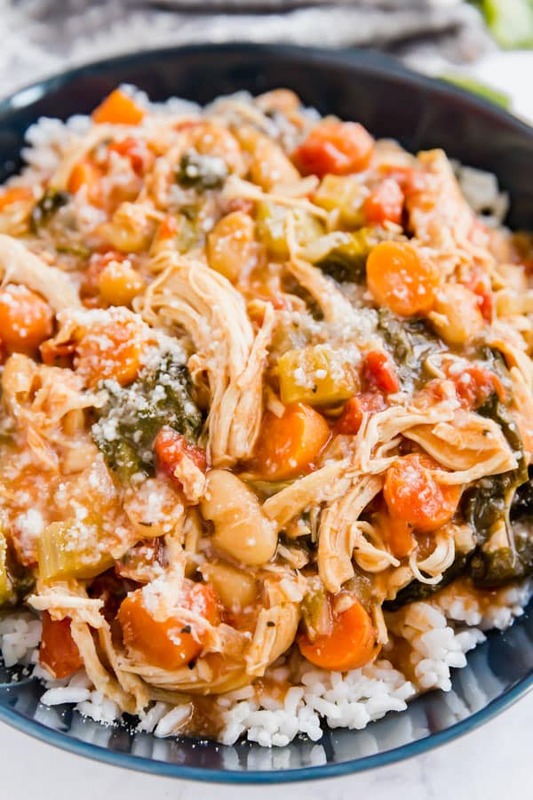 This Italian Chicken Stew is a warm and cozy dinner the whole family will love! It’s easy to assemble and dump into a slow cooker or instant pot and you’ve got yourself a killer dinner! When I think of stew, I think of chunks tender beef with tons of veggies in a thick gravy. 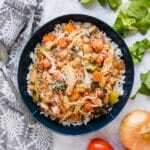 And while that’s delicious, a lighter option seemed like a really great idea so I decided to create this chicken stew recipe with my own twist on it. And since I grew up cooking with all sorts of delicious Italian flavors, that seemed like and excellent direction to take it! 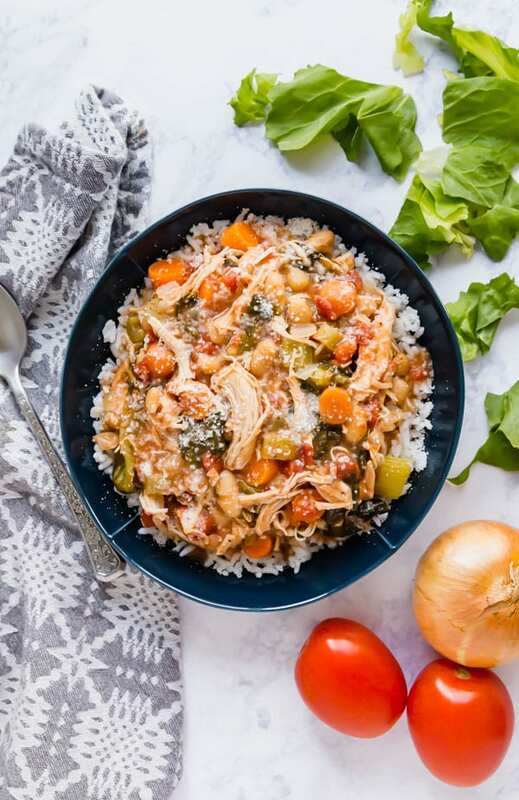 I love that this chicken stew slow cooker recipe is hearty and satisfying while still being light enough that you don’t feel weighed down and sluggish after eating. And since I made sure to fill it with a ton of delicious veggies, its also a dish that gives you all the great flavor with none of the guilt! Be sure to use full-sodium chicken broth. Low sodium makes it bland. I don’t drain the can of bean. 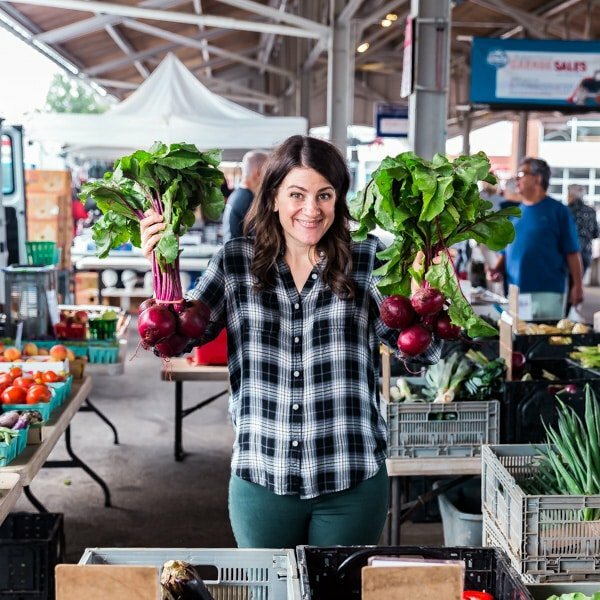 I don’t chop the veggies too fine because I like the texture and I like them to hold up to the slow cooker or instant pot. If you want this to be less like a stew and more like a soup you can add another can or two of broth. I don’t add the escarole until the last 30 minutes of cooking to help it retain some of the texture and pretty color. Always taste before serving and adjust the salt and pepper according to your taste. 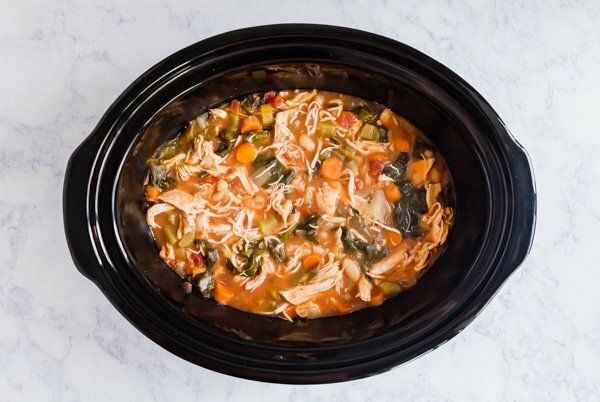 Can you freeze chicken stew? Yes! 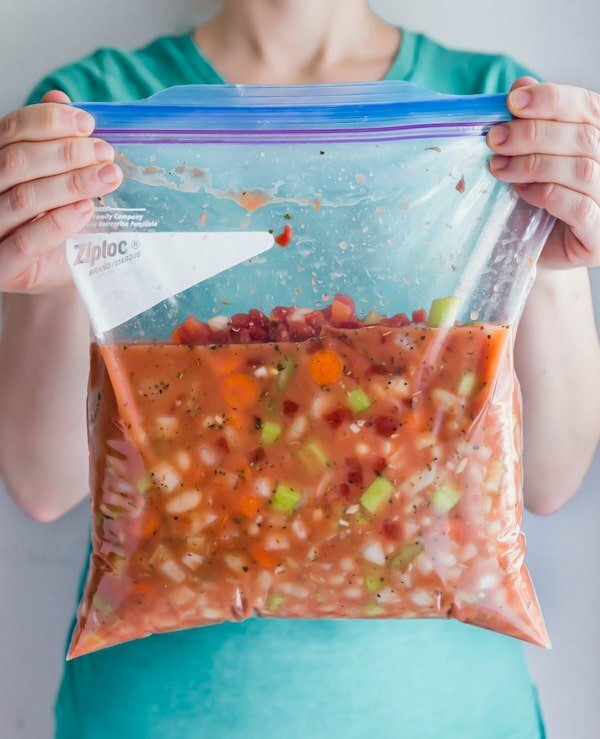 I encourage you to freeze it before cooking. 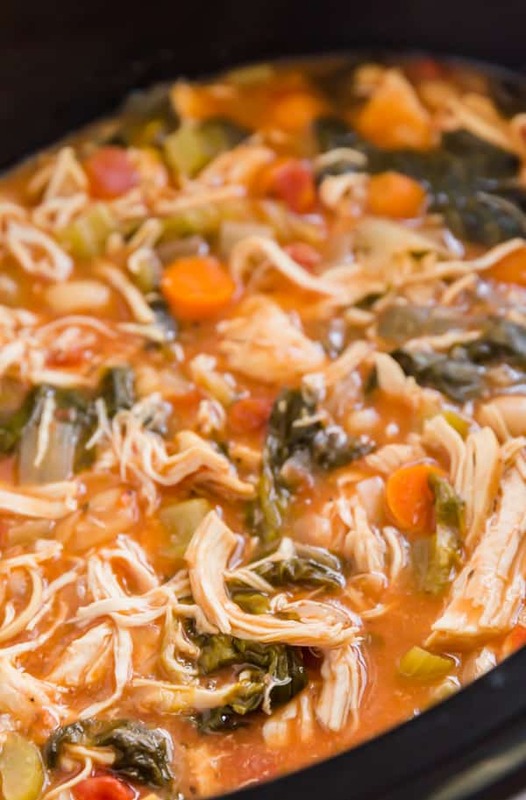 How do you thicken chicken stew? I mix 2 Tablespoons of cornstarch into the broth and that thickens it a little without it being too thick. What do you serve chicken stew with? This is great on it’s own but I love serving it over white rice. You can also serve it over cooked orzo or another pasta of your choice or even polenta or mashed potatoes to make it even heartier. How long does chicken stew last? This will last 4-5 days covered in the refrigerator. Sear the chicken before adding to the slow cooker or instant pot (you can do this on the saute setting of the instant pot). Be sure to spray with some cooking spray to avoid sticking. Make some instant rice to serve it over. 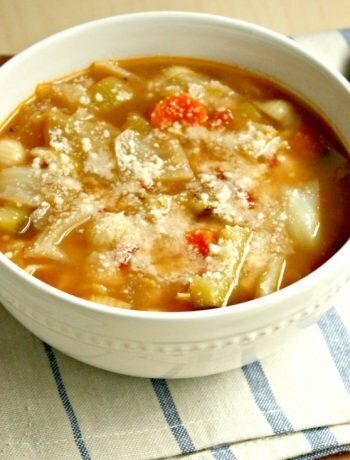 Top with Romano or Parmesan cheese and crushed red pepper flakes if you like a kick. 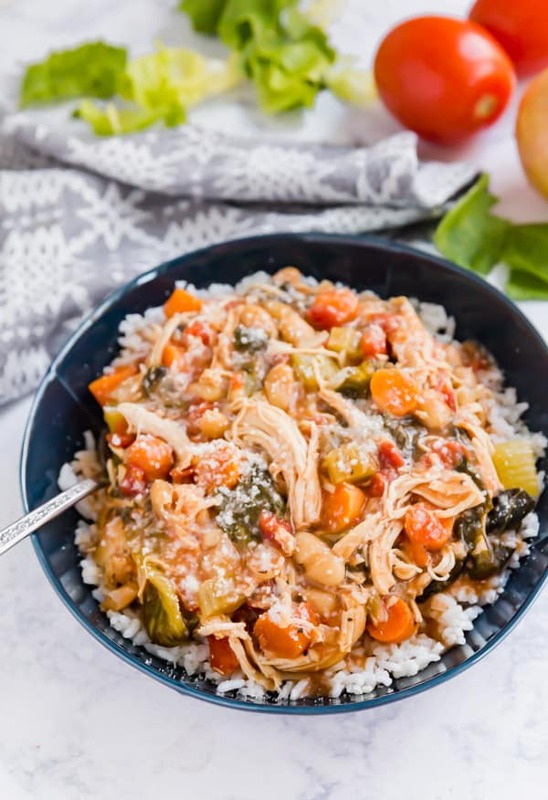 This Italian Chicken Stew is a warm and cozy dinner the whole family will love! It's easy to assemble and dump into a slow cooker or instant pot and you've got yourself a killer dinner! Whisk together broth and cornstarch until fully combined. Add remaining ingredients except for the escarole into the slow cooker (or place into a zipper freezer bag and freeze. Thaw when ready to cook). 30 minutes before the cooking time is up, shredded the chicken and add escarole. Taste for seasoning. Cover and cook for remaining 30 minutes. Serve immediately over rice with a sprinkle with cheese and crushed red pepper flakes (if you want spicy). Cover and cook on high pressure for 15 minutes and then do a 10 minute natural release. Uncover and press the Off button. Then press the saute button. Add escarole and shred chicken. Simmer for 5-10 minutes until the escarole cooks a bit. Serve immediately over rice with a sprinkle with cheese and crushed red pepper flakes (if you want spicy). 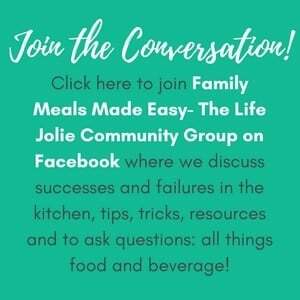 Now that you know how to make Italian Chicken Stew be sure to share them and tag @thelifejolie on Instagram and Facebook. 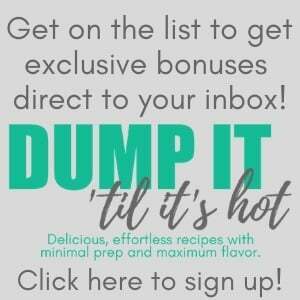 And be sure to pin it to save for later or bookmark it!